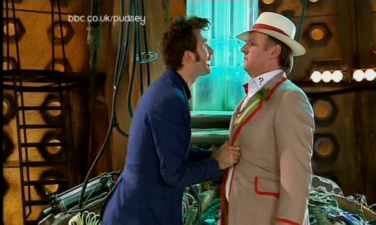 Here's the Doctor and the Doctor (10 and 5, aka David Tennant and Peter Davison) but what is the caption? aha! you've been using the Gallichan diet, haven't I? Ten: "Don't streak in here Five!" "My God, 5.Have you been out for a meal with William Shatner?" "Come closer, I want to see if a mans lips taste the same as a womans....."
Tell me his name... he won't be the first tailor I've killed! You should see what I did to the woman who made that bloody scarf! Never mind about the jacket... it'll get worse before it gets better! I thought ten was supposed to be two times five? Tell me what you've done with Nyssa! God God... You've eaten her! 10th Doctor: "Alright, fatty, hand over your lunch money - my need is far greater than yours!" 10: I see you haven't been wearing your Maidenform bra like I told you to!